He Ping Ping took Tokyo by storm while visiting the city to launch the 2009 edition of the Guinness Book of World Records. 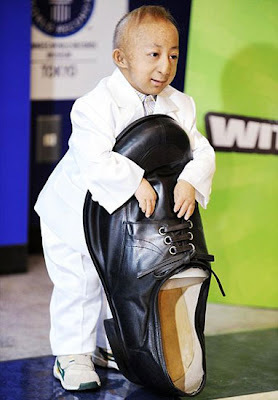 Mr Ping Ping, who was born with a form of dwarfism and is 29 inches tall and 15 lbs in weight, easily slipped into the shoe of the worlds tallest man. He has been officially named by the book as the worlds shortest man.